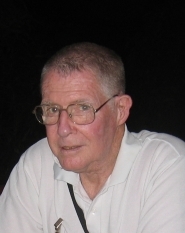 The September meeting of RAST began with a minute's silence in memory of Edward Rose, HS0ZAN, a former secretary of the RAST and long-term resident of Thailand. Edward, 78, had passed away in his sleep from pneumonia on August 11, 2010 at McKean Hospital in Chiang Mai, where he had been admitted for reconstructive jaw surgery. He is survived by his wife, Malee. For an obituary, see the left-hand column on this page. Tony, HS0ZDX, informed those present at the meeting that Malee had called to inform him that Ed had written that he wished to bequeath his amateur radio equipment to RAST. Tony and Sam, HS0ZDY, will be travelling to Chiang Mai in the near future to receive this on behalf of the society. Ed, who had originally held the Thai callsign HS1ALF and the US call W3IMH, had been RAST Secretary for the period 1977-1978. Kamol, E20EHQ, makes his presentation about recent fox-hunting activities in Thailand. The meeting also saw RAST having taken action on its decision made a month earlier to obtain a digital projector and, thanks to the generosity of Champ, E21EIC, the society need not pay for one. 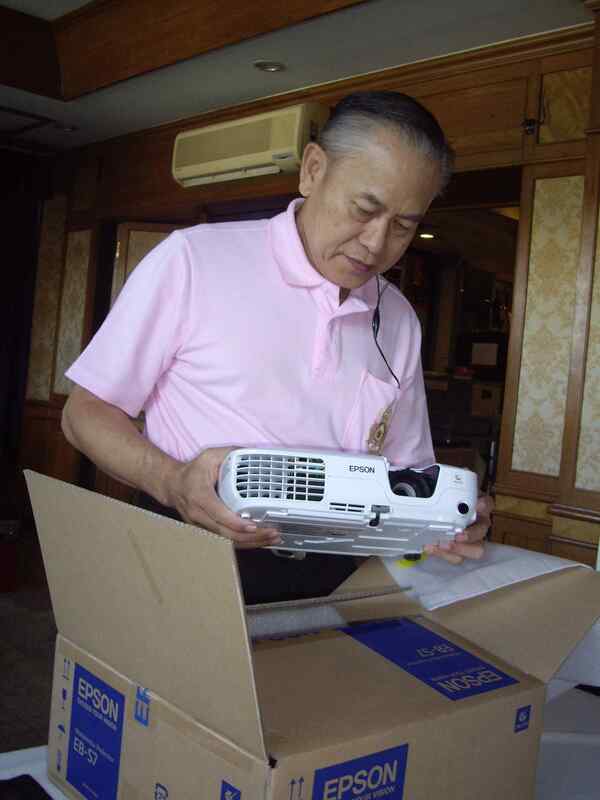 Champ personally purchased a new Epson EBS7 model for slightly over 20,000 baht and has offered to make the unit available to RAST whenever it needs one, and the projector made its debut (RAST President Chaiyong, HS1QVD) is seen here opening the box) during the meeting when it was used to display two presentations, one by Charly, HS0ZCW, about the JARL Ham Fair 2010 and the other about recent ARDF competitions in the South of Thailand by Kamol Nakchum, E20EHQ. Since RAST now has a projector, the society would like to encourage its members to make presentations that would be integrated into the monthly meetings and is also asking members to propose topics for presentations and the society would try to find an appropriate speaker/presenter. If you are reading this and would like to either make a presentation or hear one on a specific topic, please contact Khun Winit (hs1ckc(AT)rast.or.th) or Tony (tony.waltham(AT)gmail.com) by email with any offers or requests. The other news announcement made during the meeting was the granting of permission for RAST to use the special callsign E2E for special event activities and for communications with stations outside Thailand. In granting the permission for the three-character call, the National Telecommunications Commission (NTC) stipulates RAST must seek permission from the NTC prior to its usage. At the meeting, RAST President Chaiyong announced that Charly, HS0ZCW, had agreed to head a committee that would determine the rules and procedures for RAST that would determine its allocation and usage, including who the operators would be. This would be done on a fair and open basis and procedures would strictly be in accordance with the NTC's requirements. The letter of authorisation from the NTC, was dated July 30, and had been received by RAST in early August -- but not in time to announce during the August 1 meeting. Thailand's National Centre for Disaster Management and Mitigation under the Interior Ministry is staging a tsunami emergency rehearsal on September 13 for the six provinces fronting the Andaman Sea in the South and has invited RAST representatives to join a presentation at their office on Chaeng Wattana Road on that day. Chaiyong informed those present that Tempark, E20FWF, and Kamol, E20EHQ, would be attending this event on behalf of RAST. HS0AC Station Manager Finn Jensen, OZ1HET, recounted activity at the club station at AIT, noting that poor conditions during the weekend of August 14-15 had limited the number of QSOs made during the Worked All Europe Contest, and that HS0AC had made just 58 QSOs and scored 1,508 points. In the weekend of Aug 21-23, HS0AC had been active in the Russian RDA Contest and 203 QSOs had been made for a score of 390,825 points. Then for the weekend of August 29-29, HS0AC had again been active with 275 QSOs and 121,600 points being scored in the Romanian DX Contest. Champ, E21EIC, had donated 300 baht to the club station last month, Finn also noted. Tony also announced that Winit, HS1CKC, was looking forward to putting together a big team for the CQWW SSB DX Contest on October 30-31 to operate from the HS0AC club station at AIT and he would first like to encourage as many members as possible to operate. Winit is asking all who are interested to please contact him by email and, after determining the number of participants, he would decide which category the station would operate in for the contest. His dream is to have enough contest operators to enable an entry in the multi-multi category. If you are game to join the HS0AC contest team at the end of October, please drop a note to hs1ckc(AT)rast.or.th. 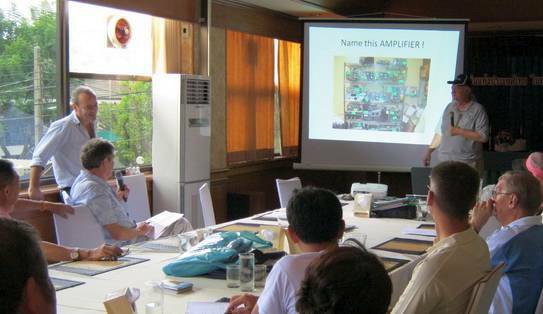 So far, there have been 50 applicants seeking to sit the ARRL-VEC approved US Amateur Radio Examination that is being conducted in Bangkok on December 11 and December 12, 2010. But there is still room for more! Champ, KY1A/E21EIC, the chief coordinator of this event, is offering a registration form that can be downloaded and would-be candidates are asked to fill out this form and then send it to him by email (see below for the address). 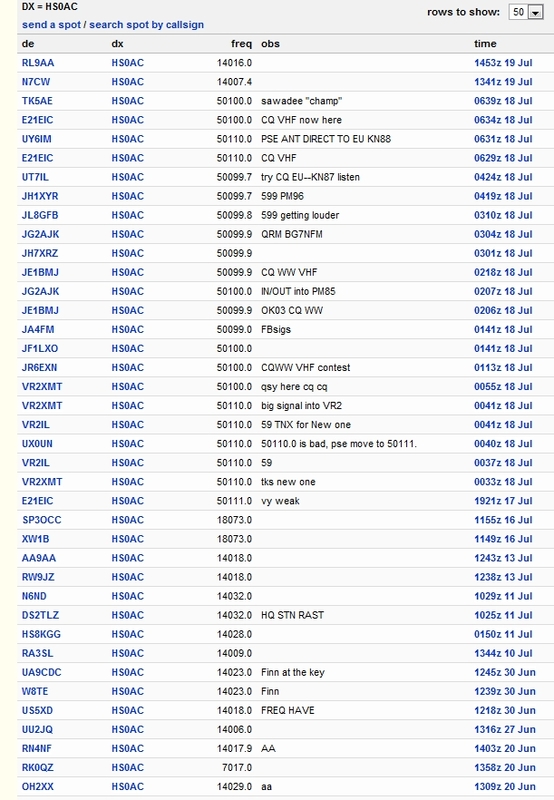 Those interested should check out the information at the US Amateur Radio Relay League (ARRL) website. Click here, select the country "Thailand" from the drop-down menu and you will find details of the location (Bangkok University) and a phone number to call. One of the highlights of the September meeting was a slide presentation of the Tokyo Ham Fair put together by Charly, HS0ZCW, who travelled there from Bangkok August 20-21, and who gave a good portrayal of the event and his experiences there in a 20-minute show. In a nutshell, he said that there was nothing terribly exciting in the way of new equipment on display, with nothing "big" from Kenwood, as some had expected, but lots of parts and quite a few old radios, ranging from Hallicrafters to Collins and Drake equipment. Charly also observed that there were very few YLs at the show (he said he remembered seeing five, not counting presenters) while he had probably been the only westerner at the JARL event at Tokyo Big Site. (He only saw one other "farang" and that was his reflection in a mirror, he said.) And most of the Japanese visitors were VHF operators, while the number of booths set up by local ham clubs exceeded that of commercial booths with equipment for sale. Attendance at the show this year was some 20,000, and about half the number there the year before. Charly had operated for 30 minutes at the 8J1A special event station there and he observed that Icom was the most active player on the show floor. Another highlight, and also putting the new projector to good use, was a slide presentation about Fox-hunting or Amateur Radio Direction Finding (ARDF) activities in southern Thailand, which took place recently in Prachuap Khiri Khan, Chumphon, Ranong and Surat Thani provinces and sponsored by RAST, the ARDF association, the Siam Cement Group (SCG) and the KMITL amateur radio society. Making the presentation on behalf of Ukrit, HS1AXC, was Kamol, E20EHQ. This presentation can be found online with captions in Thai at Sudsakon.com . 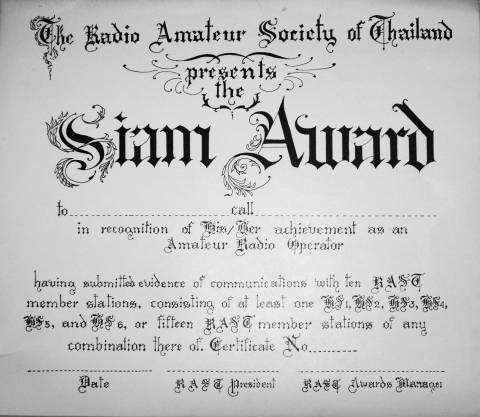 Finally, RAST President Chaiyong announced that the society intended to "revitalise" the Siam Award, which is an award that foreign and Thai stations can apply for, based on their number of contacts with stations in Thailand. Champ, E21EIC, has been asked to look into this and to draw up the terms and qualifications for this award, which had been offered to hams worldwide back in the late 1970s and early 1980s. Over 60 members and guests attended the August RAST meeting, with many of the guests lining up later on to receive trophies and awards for being the winners in different categories of the CQWW VHF contest staged in July last year. This award ceremony was organised by Champ, E21EIC, while one group of six hams (HS4ESF, HS4RAY, HS4ROI, HS4SCI, HS4SSP and HS5SSM) had travelled from Maha Sarakham in the Northeast to attend the meeting and receive awards. Sarn, HS4FYJ, tries his hand at a home-brew keyer brought to the August meeting by Toshio Nakamura, JA1WTI, as RAST President Chaiyong, seated left, looks on. As usual, RAST President Chaiyong Wongwuticomjon, HS1QVD, presided over the meeting and among the announcements he made was a plan for RAST to organise activities that would follow every monthly meeting, when a member or a guest would be invited to make a presentation about an aspect of amateur radio. This proposal had been made by RAST Vice President Winit, HS1CKC, and towards this end the society's committee had earlier agreed to obtain a digital projector that could be used in conjunction with such monthly presentations. While a budget has been set aside for this, it is hoped that a donor might be found for such a projector, which now costs the society around 3,000 baht to rent for use on a one-time basis. Chaiyong also announced that a group of RAST officers would visit the National Telecommunications Commission (NTC) on Phaholyothin Soi 8 to attend a ceremony early in the morning on Wednesday August 4 to mark Thailand's Telecommunications Day. Homage would be paid at a statue of King Chulalongkorn (King Rama 5) there on this occasion. Regarding other NTC-related issues, the RAST President also noted that the commission was still studying the RAST proposal to conduct an intermediate class training session and examination and that this was expected to be approved soon and should take place later this year. RAST was also still trying to arrange a meeting with the NTC Chairman Prasit Prapinmongkolkarn, however, the new NTC chief's schedule was very busy and such a meeting may not be able to be arranged until next month, Chaiyong explained. On the topic of fund-raising activities, those present at Sena Place Hotel on August 1 heard that Watcharapol, HS4DDQ, had been assigned to look into the possibility of arranging for shirts and caps. Among the possibilities is a custom-designed RAST shirt that could be made by Boonmeepattana Company and Khun Watcharapol was asked investigate this option and perhaps to come up with a design. Chaiyong also noted that RAST had submitted the names of three RAST officers or advisors to serve as representatives on the Interior Ministry's Disaster Management, Prevention and Mitigation committee, these being Phattanadit, HS1WFK, Thida, HS1ASC and Watcharapol. Last month saw the first authorised amateur radio operation from Thailand in the 6-metre band (50-54 MHz) in 18 years when the NTC permitted the RAST club station HS0AC to operate on six during the CQWW VHF contest. As reported here earlier, the operation had been a big success with 177 international contacts having been made with stations in four countries in the region and RAST is now soliciting international feedback and support for six-metre operations from Thailand. RAST hopes to use examples of international interest as documentation to accompany further planned requests seeking permission to operate on this band during contests and as for special event stations. Ultimately, it is hoped that permission might be granted for all Thai amateurs to use six metres on a permanent basis -- if these pioneer operations proceed well with the support of the NTC and if it can be demonstrated that there is no interference to other services. Champ, E21EIC/KY1A, a Volunteer Examiner (VE) of ARRL-VEC, is organising an opportunity for Thai amateurs who would like to obtain a US callsign this coming December. Champ will be helped out by three other VECs: Wara, E21AOY/KF6ASH, Harry, HS0ZFR/NJ2Z, Sion, 9M2CQC/WQ2C and Akira, JA1NMH/W1NMH, who will be conducting the examinations and this opportunity would be limited to 10 applicants, Champ said. Anyone who is interested may contact Champ by email; please check out the E21EIC website for his email address. 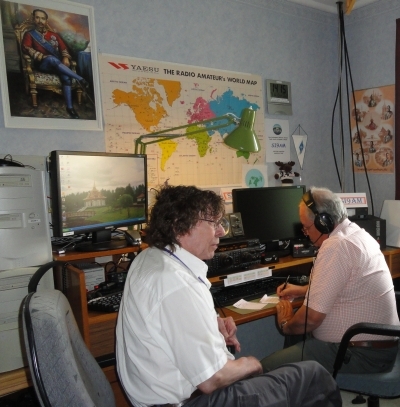 HS0AC station manager Finn, OZ1HET, presented his report the club station for July to members and guests, noting that the station had been active in the IARU World Championships (July 10-11) with 300 QSOs and 60,388 points and also in the IARU Contest (July 24-25) with 104 QSOs and 15,552 points. Finn also announced progress in the Thailand-Denmark reciprocal agreement, which he and a group of Danish radio amateurs had initiated last year and had been supported by RAST, who had written to Denmark's IT-OG Telestyrelsen (ITST) last September. The ITST had responded with a letter on July 7 to say that it was now working on a reciprocal agreement and the agency had been in contact with the Thai Embassy in Copenhagen, which had reportedly said that no problems were foreseen. The ITST was now said to be working on an initial approach, while offering the caution that the paperwork "can take some time." RAST President Chaiyong took the opportunity to congratulate Finn on this progress. Thailand currently has bilateral reciprocal agreements with eight countries, and a full list can be found here. Tony, HS0ZDX, announced that he had extended best wishes and congratulations on behalf of RAST during a QSO with Swedish Club station SI9AM on the occasion of its 10th anniversary celebrations on July 24. On that day, Svante, SM3DYU/HS0ZDY, presented a trophy on behalf of RAST to SI9AM President Lars Aronsson, SM3CVM, during a ceremony at the station which is in Utanede, Ragunda, in central Sweden. The station marks a visit to Ragunda by Thailand's King Chulalongkorn in 1897 and it is located next to the largest Thai pavilion outside Thailand. On July 24, SI9AM made contacts with at least nine Thai amateur radio stations on 14MHz: HS0/EA4BKA, HS0ZDX, HS0ZFA, HS0ZIE, E20AS, HS0ZFZ, HS0ZEU, HS0ZFD and HS1CKC (more details may be found in an earlier report below). In another development, during the committee meeting held prior to the get-together on August 1, it was decided to make a video about RAST, one that would reflect its activities and that would serve as an introduction to the society and Tony, HS0ZDX, agreed to work on this project and during the meeting began preliminary discussions about this with Charly, HS0ZCW. Before the highlight of the August meeting when presentations were made to winners of the 2009 CQWW VHF contest in various categories, Toshio Nakamura, JA1WTI (pictured above,) demonstrated and explained the principle behind a CW keyer he had built using a single IC he had obtained in Ban Moh, off Yaowarat Road in Bangkok's Chinatown. Champ began his introduction to the CQWW VHF awards with a short video featuring various amateur radio contesting activities including a look at the K3LR contest station and the World Radio Transmitting Championships (WRTC). Here is a summary of the results for Thailand for the 2009 CQWW VHF contest, along with some pictures taken during the meeting by Champ. An asterisk denotes an award-winner. 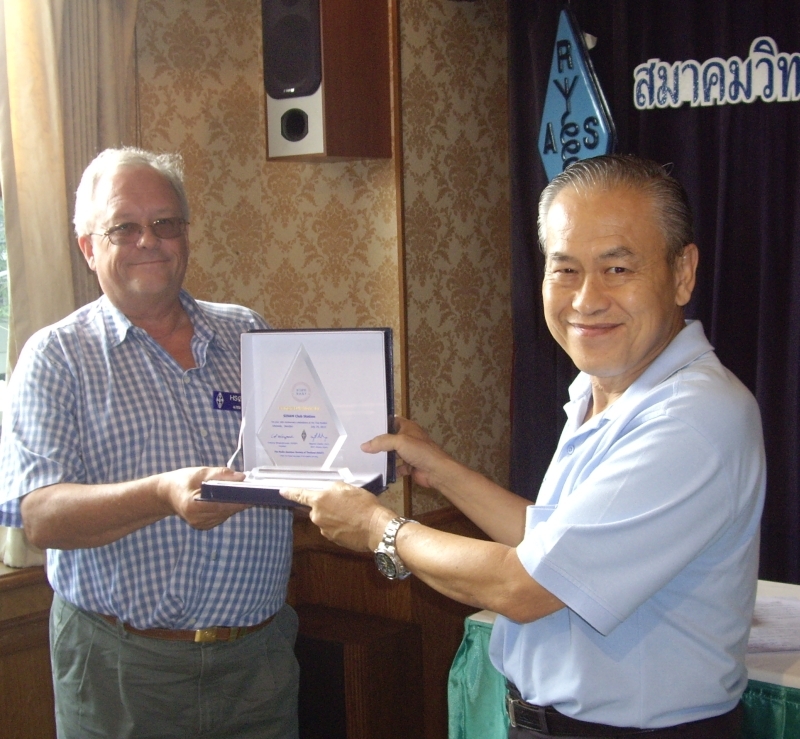 Svante (Sam), HS0ZDY/SM3DYU (left), on behalf of RAST, presents a congratulatory plaque to SI9AM President Lars Aronsson, SM3CVM, during a formal ceremony attended by scores of Swedish hams and guests at the King Chulalongkorn Memorial Amateur Radio Society in Ragunda, Sweden to mark its 10th anniversary on July 24, 2010. On Saturday July 24 the King Chulalongkorn Memorial Amateur Radio Society in Ragunda, Sweden formally celebrated its 10th anniversary at the Thai Pavilion in Utanede. 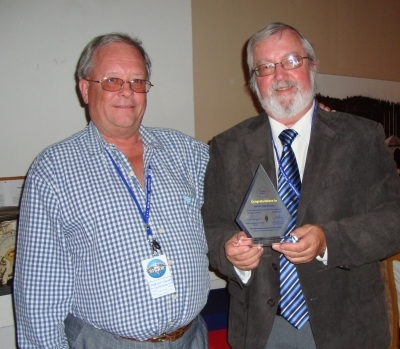 There were special activities that included a string of contacts with Thai amateur radio stations, seminars and a dinner party when a plaque (seen above) was presented to Lars Aronsson, SM3CVM, President of SI9AM, on behalf of RAST by Svante (Sam) Nordenstrom, SM3DYU/HS0ZDY. The SI9AM memorial station welcomes guest operators and is located next to the largest Thai pavilion outside Thailand, which was built to mark a visit to the location by Thailand's King Chulalongkorn a little over 100 years ago. More information about the Thai pavilion and club station can be found at SI9AM's official website. For a full story about King Chulalongkorn's visit to Utanede in 1897 and how the Thai Pavilion was built almost 100 years later, please check out the the story of the Thai Pavilion, while there are also many pictures of the pavilion. According to the official web site, when the King Chulalongkorn Memorial Amateur Radio Society was set up in Ragunda, Sweden in the summer of 2000, the aim was to offer radio amateurs visiting the Thai Pavilion the possibility to make contact with radio amateurs around the world using the special callsign SI9AM. The first contact that this station made was with the RAST club station, HS0AC, while a good relationship has ensued between RAST and SI9AM, with contacts having been made between HS0AC and SI9AM during special events on the occasion of visits by senior Thai officials to the station. Sam, SM3DYU, (right) operates SI9AM, while Jan, SM3CER, assists, as several contacts with Thailand stations were made on 14 MHz during the afternoon of July 24. The Thai stations contacted included Eddy, HS0/EA4BKA, Tony, HS0ZDX, Fred, HS0ZFA, Kurt, HS0ZIE, E20AS (active in the IOTA contest from Koh Si Chang), Swen, HS0ZFZ, Manfred, HS0ZEU, Bob HS0ZFD and Winit, HS1CKC. The homebrew antenna used by HS0AC on six-metres during the CQWW VHF contest on July 18, 2010. The Radio Amateur Society of Thailand's club station, HS0AC, operating in the 6-metre (50-MHz) band for the first time in almost two decades and running just 10 watts to a three element homebrew Yagi antenna, made a total of 177 DX contacts outside Thailand during the CQWW VHF contest on July 18, 2010. The operator was Joe, HS2JFW, who entered the contest in the single operator, single band category, and this marked special authorisation for HS0AC to operate on 6-metres by Thailand's National Telecommunications Commission (NTC) following a formal request from RAST. The countries worked were Vietnam, China, Japan and Hong Kong and many reports received from the DX stations were 599. Propagation was thought to be Sporadic-E. 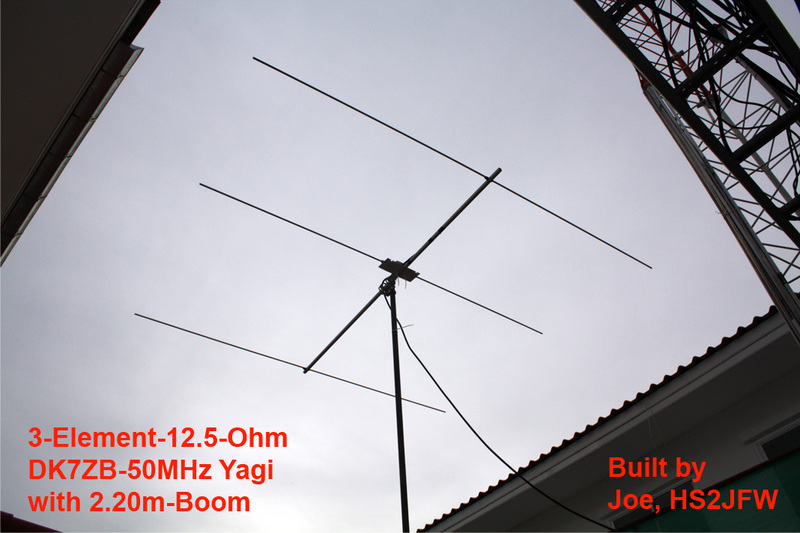 The transceiver used was a Yaesu FT-736-R while the antenna was a home-brew three-element Yagi array (pictured above). 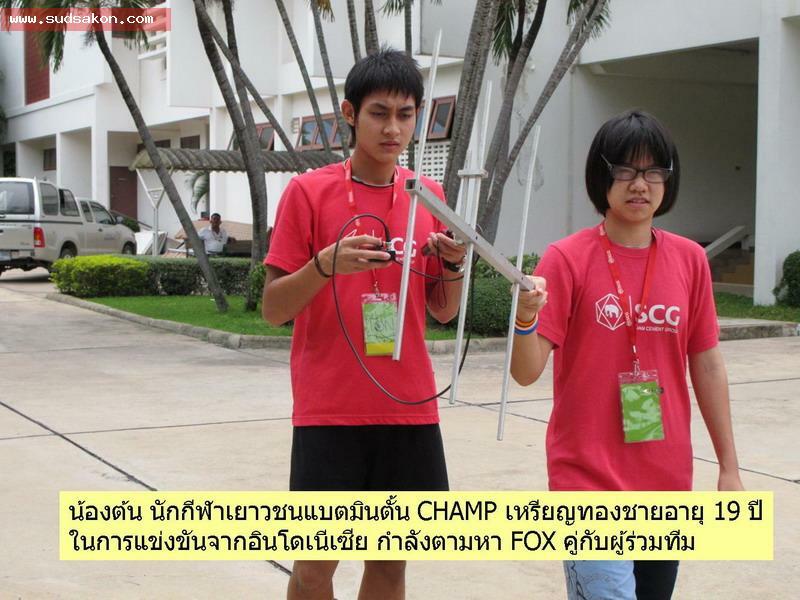 The last time radio amateurs in Thailand had received permission to operate in the six-metre band had been in 1992 for a special station authorised to operate in Chiang Mai, northern Thailand, during the SEANET convention held there that year. Permission for the contest operation on the six-metre band during the CQ WW VHF contest had been sought for all Thai radio amateurs earlier this year, but the NTC had granted this permission just for RAST's club station, HS0AC, which is located at the Asian Institute of Technology campus just north of Bangkok. RAST intends to continue to seek permission for Thai hams to use 6-metres for participation in contests and for exhibition purposes and hails the successful operation with a big pile-up having been encountered at times during the contest. It is hoped that eventually that Thailand's telecom regulator will authorise the use of the 6-metre band for all Thai radio amateurs now that Thailand's TV Channel 3 transmitter, which had been broadcasting its video on a neighbouring frequency on 55.25MHz, has relocated its transmissions to a UHF frequency. Under an international footnote to the ITU radio regulations, spectrum from 50-54 MHz in Thailand is allocated to fixed, mobile and broadcasting services on a primary basis, with amateur radio being assigned on a secondary basis. Chaiyong began the July meeting by thanking RAST Vice President Winit Kongprasert, HS1CKC, for hosting the June meeting in his absence. He had been on a trip to the United States, when he had met RAST adviser Fred Laun, K3ZO/HS0ZAR, and ARRL President David Sumner, K1ZZ and his XYL Linda, when they had had lunch together. In an update on the forthcoming intermediate class amateur radio examination, Chaiyong announced that while RAST had been lobbying for the Morse code component to be waived, the NTC had indicated that to introduce such a change would likely result in a long delay. Consequently, RAST had decided not to hold out for a code-free examination and training session in order to speed things up and so that the test might be conducted at the earliest opportunity. 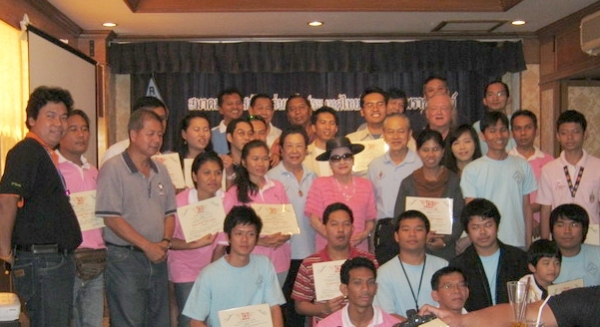 At left, RAST President Chaiyong and, next to him, is Vice-President Winit, HS1CKC, while second from right is ThaiBev's Off-Road Club President Sawat Sopa and at far right, is the secretary of the Off Road Club, Khun Nopporn seen during the meeting on June 17, 2010. In mid-June, senior RAST representatives met with ThaiBev's Off-Road Club executives to discuss the possibility of co-operation in the hosting RAST's planned car rally. 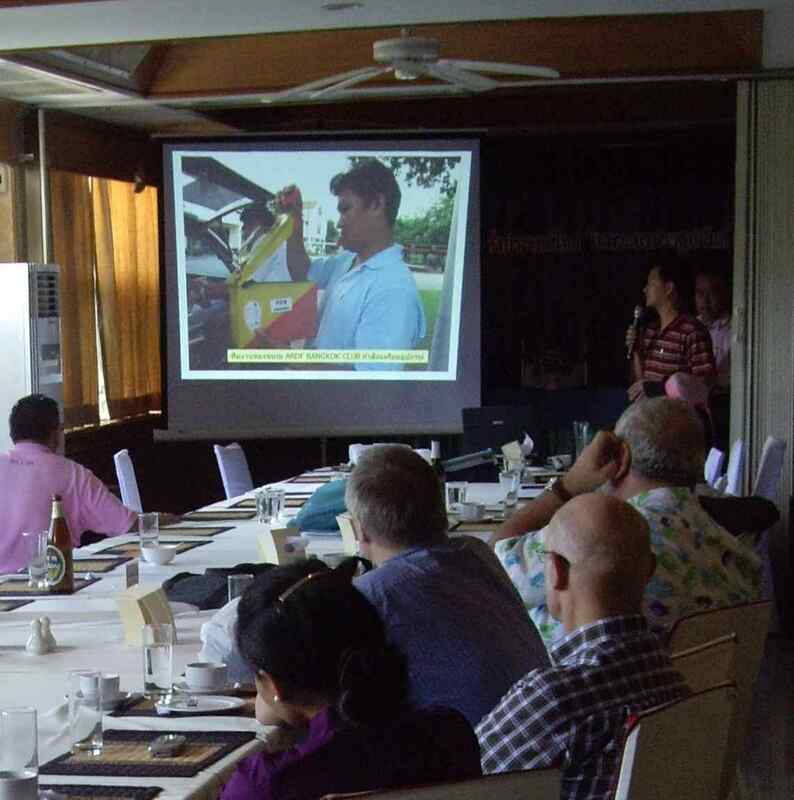 Members at the July meeting heard that the meeting had gone well and both parties had introduced themselves and explained their organisations' respective activities and goals, with the ThaiBev Off-Road Club mainly focussed on charity work oriented towards villagers living in remote areas of Thailand. RAST and ThaiBev agreed to explore ways to combine their resources and will continue to exchange views around helping remote communities and in raising funds. Vice President Winit, HS1CKC, will pursue these possibilities on bahelf of RAST and will also co-ordinate ongoing efforts to organise RAST's car rally later this year. The meeting further bolstered a long-term relationship between ThaiBev and RAST, as the company has been a long-term supporter of RAST special event activities, including the sponsorship of draught Chang Beer during the international SEANET conventions hosted by RAST in Bangkok in 2004 and again in Lampang in 2007 In another fund-raising activity, RAST intends to design and print up a shirt with a suitable logo and slogan for members and Wacharapol, HS4DDQ, has been assigned to follow-up on this, members were told. Thailand's National Disaster Management Centre under the Interior Ministry is seeking amateur radio representatives to join a working group and during its committee meeting earlier at the beginning of the month, RAST officers came up with several names that they would nominate, including Phatanadit, HS1WFK, Joe, HS2JFW, and Thida, HS1ASC. RAST also intends to formally appoint several members to join a team of consultants. This group will be chaired by former RAST president Mayuree Chotikul, HS1YL and those to be appointed will include Thaweewit, HS1KBG, Joe, HS1JFW, Opas, HS1SPX, Jojo, E22JNE, Thida, HS1ASC and Chada, E21QJU. During the second week of July, RAST President Chaiyong intends to lead a small group of senior RAST representatives to meet and congratulate Prasit Prapinmongkolkjarn on his appointment as NTC Chairman and also to meet NTC Commissioner Dr Natee Sukonrat. In his monthly report about the HS0AC club station, Finn, OZ1HET, noted that the All Asia DX Contest CW, HS0AC had been active with a final score of 715 QSOs and 150,000 points, and noted that he had worked five Thai stations during the contest, E20HHK, E21YDP, E29AN, HS0EHF and HS4BPQ. He also thanked Champ for a 300 baht donation for when he operated the WPX CW contest from the station. 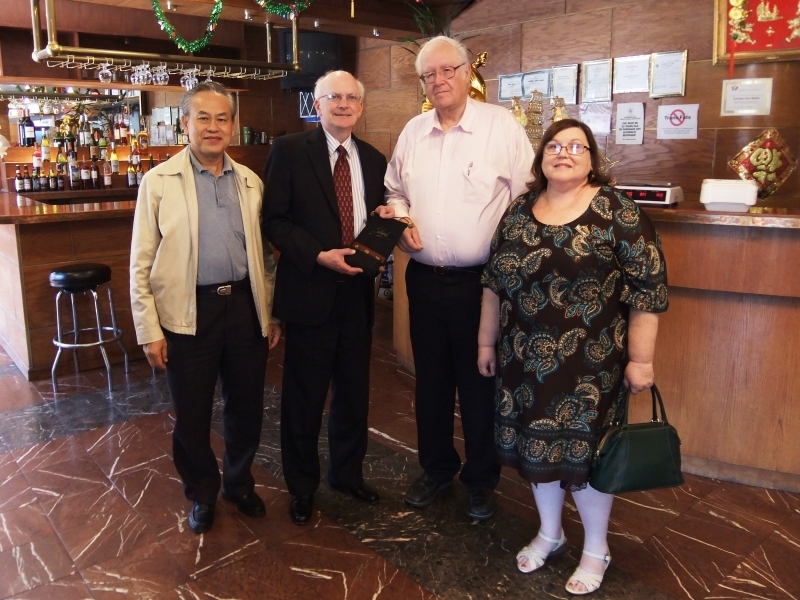 While in the United States of America during the month of May, RAST President Chaiyong Wongwuticomjon had the opportunity to meet ARRL Chief Executive Officer and former IARU Secretary Dave Sumner, K1ZZ when they had lunch together along with RAST advisor Fred Laun, K3ZO/HS0ZAR, and Dave's XYL Linda, KA1ZD. The group is pictured here after Chaiyong presented a pennant to Dave on behalf of RAST. 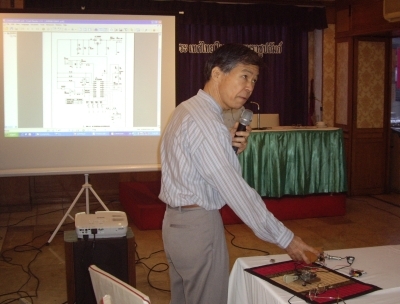 During the meeting, Chaiyong was able to brief the ARRL CEO about developments around amateur radio in Thailand, including progress in the forthcoming intermediate class amateur radio examination that RAST has been seeking authority to organise from the National Telecommunications Commission (NTC). Thanks to Fred, K3Z0 for this photo. The King Chulalongkorn Memorial Amateur Radio Station in Ragunda, central Sweden which operates with the callsign SI9AM will celebrate its 10th anniversary on July 24, 2010 and representing RAST during the celebrations will be Svante (Sam), HS0ZDY/SM3DYU. During the May meeting at the Sena Place Hotel, RAST President Chaiyong, HS1QVD conveyed his congratulations in advance of the occasion to Sam and presented him with a special commemorative plaque that RAST has designed. In late July Sam will present this plaque to the SI9AM Council, led by President Lars Aronsson, SM3CVM during the anniversary celebrations. He will take the plaque to the station which is next to where a Thai pavilion marks a visit to Utanede there by Thailand's King Chulalongkorn (King Rama V) over 100 years ago. At the May meeting, RAST President Chaiyong, HS1QVD also recapped the decisions and developments made during a committee meeting earlier in the day, including an update on the impending intermediate class licence and the possibility of new club stations at Asia University and the Science Park. For the upcoming exam, which is now in the hands of the National Telecommunications Commission, RAST understands that the Morse code requirement will not be waived, although it might be a written test (in dots and dashes form) rather than a demonstration of the ability to copy and send code. Regarding the possibility of new club stations, Thomas, HS0ZDF said he had not had the opportunity to speak with officials at the Science Park, and he also said that the new office building of the National Housing Authority might also make a good location for antennas, adding he would follow up on this. As for Asia University, the Voluntary Radio Association has invited RAST to jointly participate in a club station, and to help by providing the HF component. Discussions were continuing, with Kanchit, HS1JC, representing RAST, members were told. Finn, OZ1HET then provided a report on activities at the HS0AC club station on the campus of the Asian Institute of Technology, noting that during the weekend of April 3-4, HS0AC had been active in the Polish DX Contest but propagation had been very bad, with only 54 QSOs and 3,078 points scored. On the Weekend of April 10-11, the Japanese International CW DX contest was running, with HS0AC making 301 QSO's, gaining 34,454 points on four bands. Finn also reported that John Gagen, HS0ZDJ/W2YR had donated a nearly-new microwave oven, for which RAST is most grateful. Swen, HS0ZFZ then stepped up to the microphone to provide a report about the Songkran DXpedition to Koh Chang from April 10-15. He said operations had been disrupted by a solar storm, yet despite this, and with two stations set up, the operators made a total of 5,300 QSOs, which had exceeded their goal of a minimum of 1,000 QSOs a day. Derek, HS0ZJH, then stepped forward to praise Swen for his help in having provided a cash loan, unasked for, to Derek after he had lost his credit card during the DXpedition, and that he very much appreciated this help from a fellow ha. He also asked that these remarks be put on the record of the meeting. Looking ahead to upcoming contests, Champ, E21EIC reminded everyone that CQ World-Wide CW WPX contest will take place on the weekend of May 29-30 and that there would be a group effort from HS0AC, with any volunteers being welcome to join the team, while Narissara (John), HS1CHB told members that RAST would be seeking special permission from the NTC to operate six metres (50MHz) during the CQWW VHF contest in July. To access the RAST archive covering period from January 2010 through to April 2010, including our 2010 New Year party, click here.